In keeping with our philosophy of offering a single source of construction supplies, Kuhlman Corporation began providing water and sewer products to contractors and municipalities several decades ago. Frames and grates for manholes and drains. Drainage pipe and trench drains. Valves and fire hydrants; water meters. Repair clamps, sleeves and couplings. For information or pricing on these products, call 419/531-2613 or visit our location at Reynolds Road and Central Avenue (Yard 4) in Toledo where we stock many underground products. 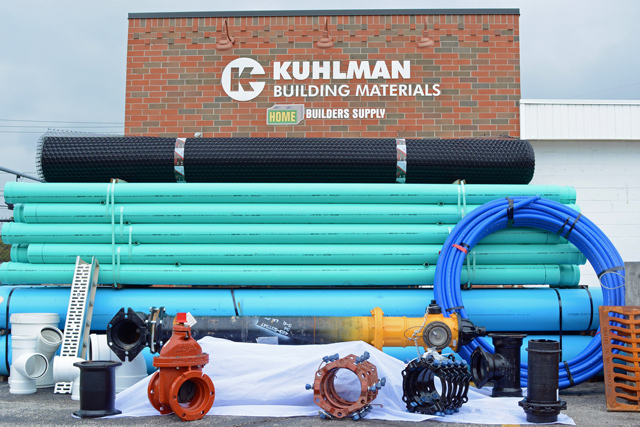 Contractors look to Kuhman for their sewer and water material needs because of the Company’s knowledgeable people, years of experience, and extensive inventory of products and accessories from leading manufacturers. For assistance, contact Kuhlman at 419/897-6000 or 1-800/669-3309, or phone a Kuhlman branch. For all your Underground Product needs, specify Kuhlman Corporation for value, quality and service.